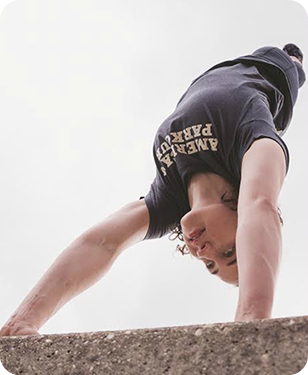 Parkour is a fantastic way to get in shape, have fun, and challenge yourself to overcome both physical and mental obstacles in your life. Because parkour is currently a predominantly male discipline, we’ve carved out a corner that highlights the women’s parkour community. We are working to provide an access point for women so that we can build and strengthen the parkour community as a whole. Our values are the same, our love of movement is the same, but sometimes we just want a space of our own. Here at APK we think there are benefits to both. Training exclusively with other women may serve as an access point to parkour, especially for beginners. Some traceuses find that being in a less-intimidating environment helps them feel comfortable trying new skills (take a look at this article entitled “Why No Boys?”). Other females prefer to “jump” into a co-ed environment and reap the benefits of training with larger, more diverse groups. Either way, the important thing is to get out there and have fun! Where are all the chicas? Feeling a little alone? Look no further! There are lots of great women practicing parkour all over the world!